Last time I did this workout, 4x2km with 5 minutes rest, was on April 29th. Then I managed a 2:12.2 average, so today I was shooting for “faster than 2:12”. As I have a day off, I also wanted to take the time and experiment with the footstretcher location. After watching my video, several people suggested to move the footstretcher slightly sternward. So I did, but not immediately. The plan was to row the first two 2kms with the old rigging, and then change. I would take a bit more time between intervals #2 and #3 to move the stretcher and to get a bit more rest, so that hopefully fatigue would not influence the experimental results too much. 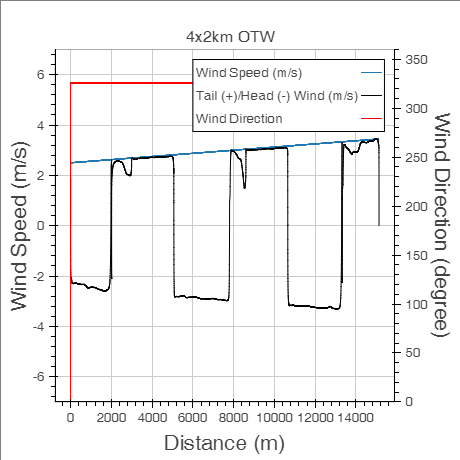 Wind was between 1 and 2 m/s varying between North and NorthWest, according to SportTracks, and it was between 2.5 m/s and 3.5 m/s NNW according to WindFinder’s prediction. On the water, I definitely noticed that the wind was growing. Between the tailwind intervals #1 and #3 there was definitely a stronger tailwind in #3, but also the water changed from “ripples” to “small chop”, and I wasn’t faster in #3 (with the new footstretcher setting). For the headwind intervals #2 and #4, pace went down by 3 seconds (from 2:09 to 2:12) with #4 being the slowest interval. Definitely a interval #4 was the hardest battle seeing the slowest splits at some points. I also noticed that interval #4 got quite sloppy in one point. When I realized it, with about 500m to go, I started to focus more on technique, which gave me a few seconds of split in the right direction (it could also have been the effect of a slight turn in the course, which made the wind less head-on and more cross-wind). 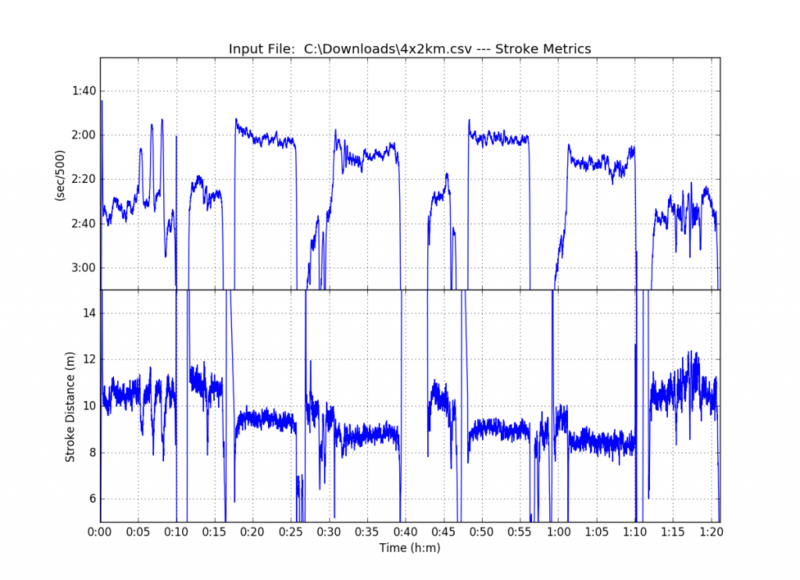 Stroke length info. Did my strokes get shorter with the new rig? Or is it the effect of fatigue? You can see more on the workout page or the interactive plot on rowsandall.com. Measured distance between stern (“front”) side of front stops and the line connecting the oarlock pins: 18.0cm, with front stops being more sternward. I am actually not sure how people measure this without help, and I am not sure how accurate these measurements are … OK, will do more measurements tomorrow. Also, I forgot to measure footstretcher height and angle. I will keep the footstretcher at the new position for a while. Boat didn’t feel significantly heavier at the catch. 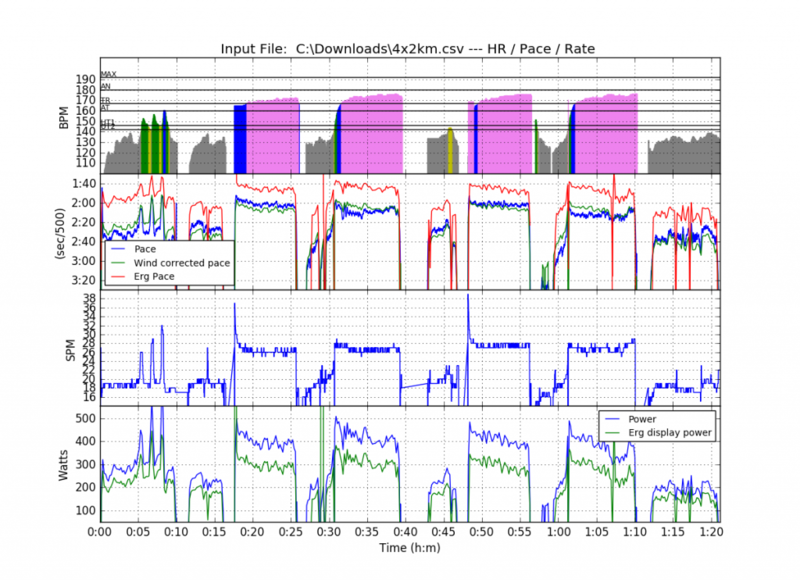 Import your data from the Concept2 logbook for advanced plotting and sharing. Concept2 doesn’t allow to see the rows of other people. Rowsandall.com allows you to overcome that. Actually, everything I do on this blog is now going through that site. Bugs are starting to get relatively minor and seldom, so I encourage you to take a look, register, and try it out. Comments here or on rowsandall.slack.com. The blue line is today’s workout. The red line is the same workout on April 29th. Today’s track. The start of the tailwind 2ks are at the north-northwest end of the straight legs. 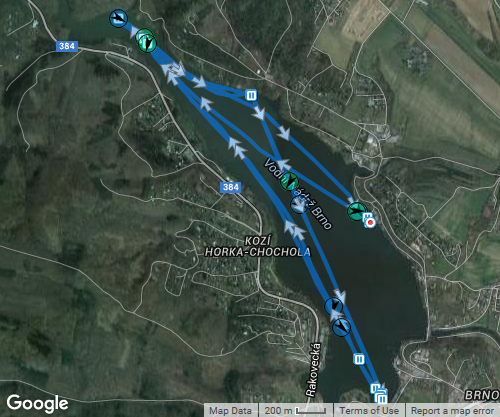 The headwind 2ks start at the bottom right (near “Rakovecka” street) and take a slight turn towards NW. 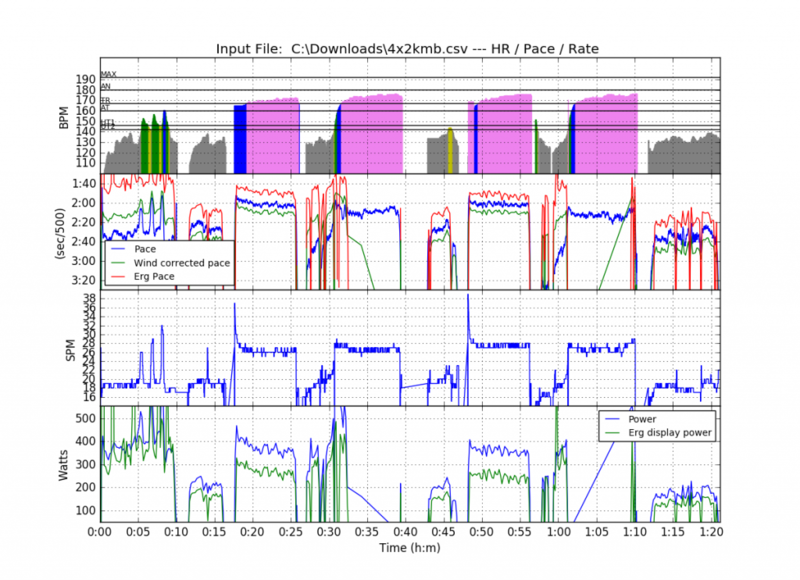 Both plots were generated directly on rowsandall.com using the wind editor. I haven’t implemented wind correction on the site yet, but I have it working on the desktop. Please don’t look at the “Erg Power” and “Erg Pace” lines. They are off and I know it. That’s the next step. As the whole calculation takes about 10 minutes, I need to program this as a “background task”, enabling the users to come back to the calculations once they are done (and sending them a message when that is the case). 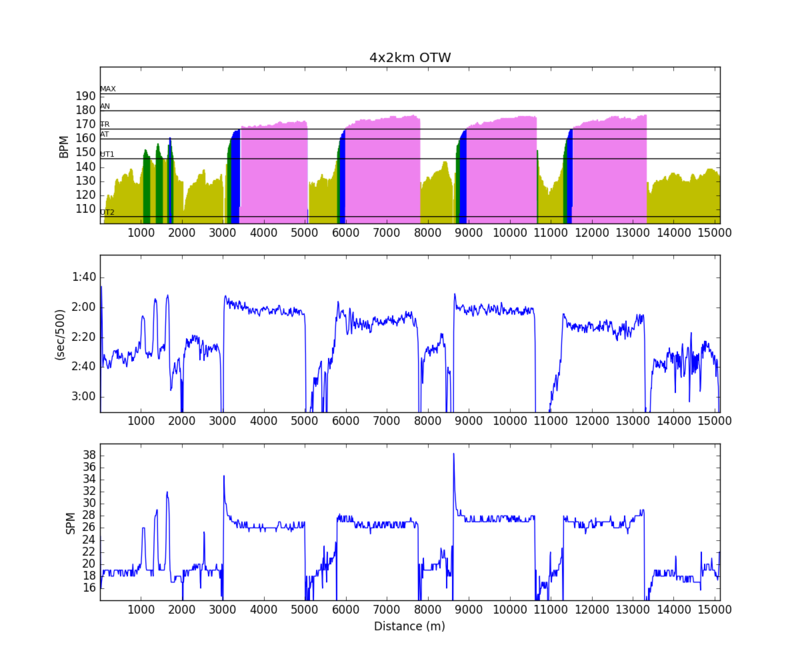 As you can see from the second plot, the calculation sometimes fails. Need to look into this a bit more. 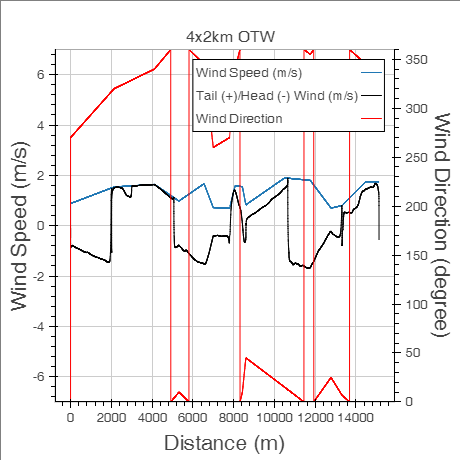 Comparing the tailwind section’s comparisons, I think the truth is somewhere between the two plots.